Well well well, it just keeps getting better and better at Tokkuri-Tei! I cannot tell you how in-awe I was after walking out. Everything we had was absolutely amazing. But, in all honesty, it was really our Sushi Chef, Ryuji, who made our experience all that more impressive and extraordinary. I've never had a Sushi Chef like him, and I wish there were more like him now! He tailors your plates to your liking. He gets a feel for the kinds of foods you like, the textures you enjoy and uses his magic to whip up some extremely orgasmic combination. Your taste buds have never had anything like it, TRUST ME! FFF: Can I get Ikura? R: Ok, do you like Takuan? R: Ok, I make it with Takuan and.....some Negitoro...how does that sound? FFF: (Eyes lit up) That sounds awesome!! Upon serving it to us, he explains that the negitoro is a bit frozen or really cold, because earlier I had told him I didn't like O-toro for its tough and oily texture (and that I prefer Chu-toro- less oily and ultra-tender). When the Toro is extra cold, you don't get that oily film in your mouth. Give the guy some credit, he sure does listen well (and there are very few men out there that do...)! And, Ryuji does a damn good job of explaining everything. He explains where the ingredient came from, or why he uses a certain ingredient, or why the ingredient is frozen. For example, he grated some lemon zest from a frozen lemon, because the taste would be too strong from a regular room temp lemon. The coldness takes away some of the bite. You learn so much from this guy! He trained in Japan, and he is a wealth of knowledge. So amazing. Plus, this guy's got such a sense of humor! Hilarious guy. You will really enjoy sitting at his bar. Entertaining...and not the annoying kind. If you go to Tokkuri-Tei (which I hope you will), don't bother sitting at the tables. Ask for the Sushi Bar. Then, hope Ryuji is working. Ankimo. But not the regular Ankimo is Ponzu with radish. This ones got some sliced up, marinated Ahi Skin. Ryuji said it goes the chewy texture of the skin goes well with the "mushy" texture of the Ankimo. And it did. Mind you, he said he also marinated the Ahi Skin for 2 weeks, changing the marinade 3 times. With good food, you must be patient. My friend Mallorie introduced me to this dish, Chutoro Yaki. Ultra-tender, seared Chutoro with a light citrus-y and sea salt taste. Now, one of my favorites. Marinated and cooked Chutoro with sweet peppers. I still prefer how it's prepared in the above picture. I love the colors in this dish! Orange, yellow, green and pink! Not only pretty, but seriously delicious. Negitoro with Takuan and Ikura topped with frozen lemon zest. Ryuji asked us if we liked vinegar. I said yes. Then I saw him sopping up what looked like sewage into a shooter. "WHAT is THAT?" I said in a loud voice. "Better not say that again or I'm gonna make you more weird food!" he kidded. It's called Mozuku- Angel Hair Seaweed in a Namasu-like marinade. If you like vinegar, you will love this shooter! Looks almost unpleasant, but this was one of my faves, and I wished I had ordered another! A slightly crunchy texture. Topped with grated ginger and white/black sesame. Short version name- Una-Tama. Basically Unagi wrapped in Tamago. But this was FRESH. We saw Ryuji wrap up the Unagi into a roll, slightly deep fry, all the while cooking up some eggs. All of a sudden, the roll was being cooked into the egg! He then conforms the egg into a nicer roll-shape with some wax paper and bamboo mat. Sharp knife to slice up roll, plate it, add unagi sauce and sprouts....TA-DA! By this time, we're stuffed. But, no you're not leaving without some Condensed Milk Frozen Strawberries!! These little bursts of flavor amaze me. The easiest desserts to pop in your mouth! Ryuji said he just made 800 of these little suckers in a week! Imagine that. Black Sesame Ice Cream from La Gelateria. Black Sesame sauce flown in from Okinawa. Has a slight taste of peanut butter, but still ultra-delicious. By the time I looked down, I had finished my bowl. Must be the delectable taste and Ryuji jabbering away with us. Then, before we said Goodbye, he asked me if I was going straight home. I nodded, but immediately turned to my friend and said "Oh no, was that the wrong thing to say!? I don't want a shot of something!" 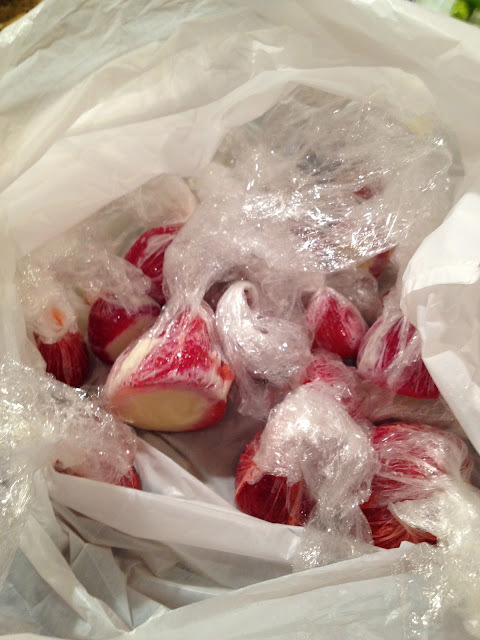 But, surprisingly, he came back with a bag of Condensed Milk Frozen Strawberries for me to take home. Thank you, Ryuji! You da best! 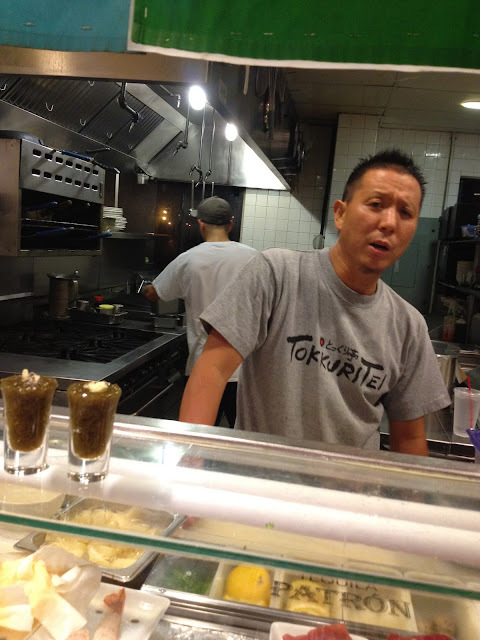 Kimberly- Not sure if you heard but Chef Ryuji just opened up his restaurant, Sushi Murayama. It's located on Sheridan street in a new building behind Wal-Mart and next to the HMSA building. You should go try it, it's AMAZING!